Today is Veteran’s Day, when the country honors the service men and women who have given up so much to ensure our freedom. And right alongside those human warriors canine soldiers often serve, trained to protect the troops and keep them from harm. On Nov. 7 a special ceremony was held on Capitol Hill with the American Humane Association, a Tribute to War Heroes on Both Ends of the Leash. The reception was made possible by Virginia Congressman Jim Moran, the co-chair of the Congressional Animal Protection Caucus. Rep. Moran represents Virgina’s 8th district, which includes Alexandria, Arlington, Fairfax County, Reston and Falls Church. Special guests at the ceremony included a man whose guide dog saved his life by leading him down 78 flights of stairs in the World Trade Center on 9/11, and two military working dogs who served in Iraq. 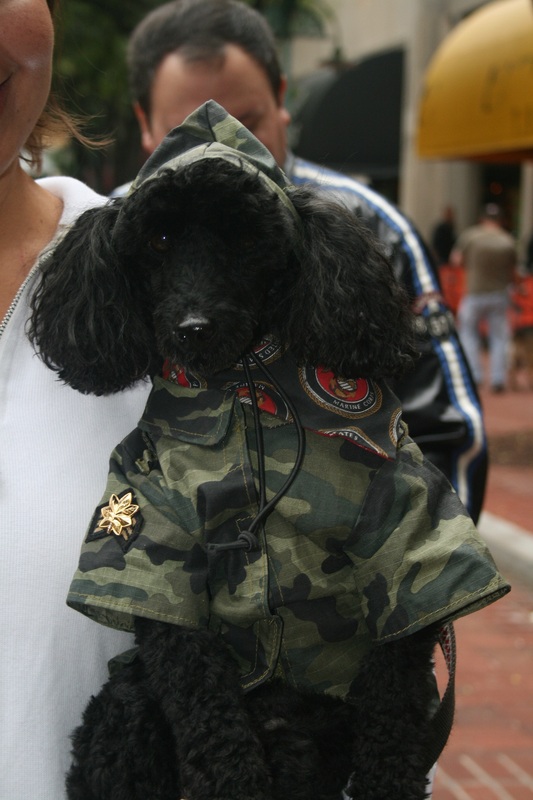 Watch Fox channel 5’s story: DC Tribute Honors Military Dogs. Speaking of hero dogs, the Hallmark Channel is premiering the American Humane Association Hero Dog Awards tonight at 8:00 p.m. EST. Eight canine finalists will be honored for their devotion, bravery and companionship. The dogs were selected in a nationwide online search and represent categories of working dogs including service, therapy, military, law enforcement and arson, hearing, guide, and search and rescue. Dogs aren’t just helping our military during combat tours, either. Organizations such as Pets2Vets, based here in Arlington, are rescuing shelter dogs and training them to help veterans cope with combat duty-related issues such as Post Traumatic Stress Disorder. I wrote about P2V founder Dave Sharpe in a post last year. Our human and canine military protectors deserve to be honored every single minute of every day for all they do for us. Make sure to thank a vet today.